Today marks the time when the days will start to get lighter again: Solstice! The days will become longer starting now. It’s a great reason to celebrate, and it’s the reason we put lights on trees! Before electricity, people would put candles in trees outside to light their way this time of year because it got so dark out. So on this darkest of dark days, I have much hope for the future and wish you all the best during this holiday season! Happy Solstice back to you, Gail! I have been enjoying your posts this month, especially seeing your progress on your new hexie bird! 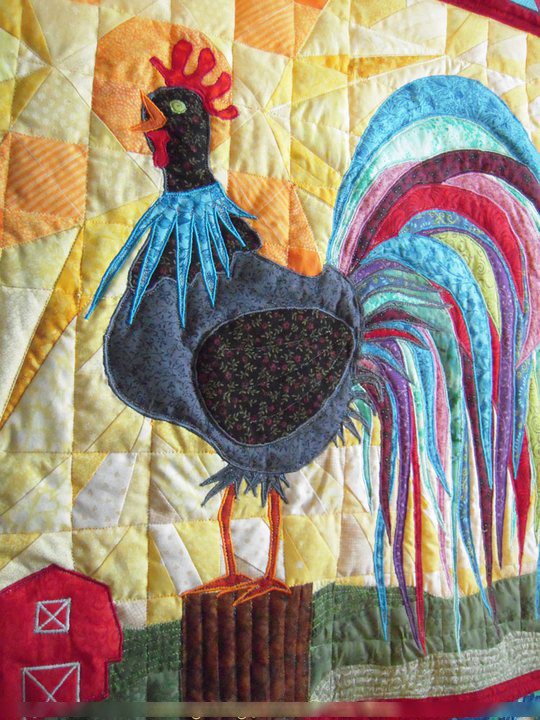 I love all of the colors in the Rooster Wall Quilt. And, am a big fan of the days getting a bit longer each day, too. Thanks! Yes, that sunshine helps create a happy heart!